This article is intended for advanced users only. ATmega328 microcontroller which communicates with the Raspberry Pi over SPI. A 16 channel servo controller (PCA9685) with beefy power traces. A Power MOSFET to enable or disable all servos. An I2S soundcard with a 5W mono class-D amplifier, to be used with a 4 ohm or 8 ohm speaker. A 12 channel capacitive touch controller (MPR121). 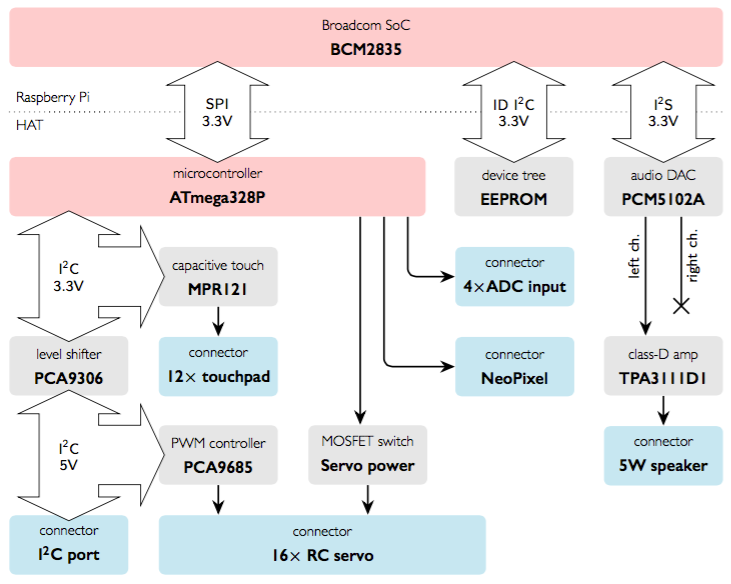 A 4-channel analog sensor input. Protection circuitry: TVS diodes, reverse polarity protection, etc.